Analysts have established that in about 70% of the reported help desk cases, IT first learns about performance and availability problems when the users call to complain. At Aternity, we work with organizations throughout every major industry and continually hear from our customers that Aternity’s ability to immediately discover key End User Experience metrics is essential to helping them ensure proactive detection of performance issues beforeworkforce productivity is impacted. 1. 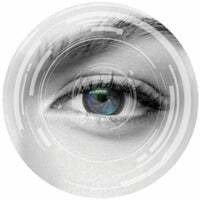 Users and Locations | Key attributes relating to users and their locations, such as identity, role, department, office and geographic location, subnet, and VPN, to analyze the impact of performance on the workforce. 2. Devices and Operating Systems | Key attributes of every reporting device, including make and model, core count, disks and shared drives, OS information, boot metrics, running processes, and the top resource-consuming processes, to help assess how performance is affected by device configurations. 3. Applications, Processes, and Health Indicators | Performance of custom-developed and commercial applications running on physical or virtual infrastructures, in your own data center or running on the cloud, to help understand actual application usage volume and usage times. All this ‘immediately discovered’ information is readily available for viewing in the feature-rich Enterprise Applications dashboard, which is also the default homepage when users log into Aternity. It has proven to be one of the most highly-accessed dashboards by our customers because it shows all relevant usage, performance, and health aspects for every application (even if it is not explicitly monitored) in a single view. IT teams have embraced this macro-micro view because it seamlessly combines application usage and performance with individual performance of geographic and business locations, departments, device types, and operating systems, while also displaying usage and health trends over time. The Enterprise Application dashboard enables these IT teams to interact with the data and examine it at many different angles. 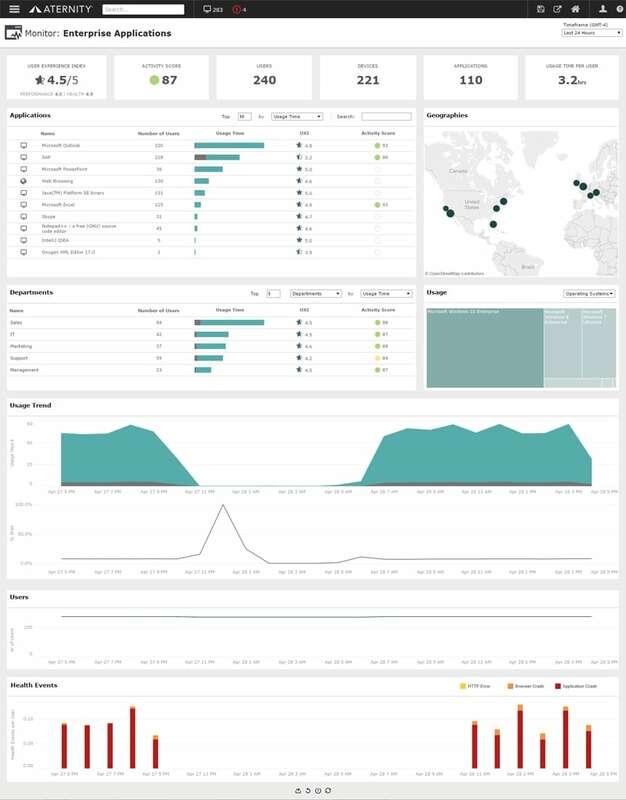 The sections of this dashboard provide easy drill-downs into further specialized dashboards so that IT’s investigation into the real end user experience can go much deeper, essentially making the Enterprise Applications dashboard an ideal starting point for most use cases, and a natural choice to be the system’s default homepage. Above, you can see that in this Enterprise Applications dashboard and for the selected timeframe (which goes from last 60 minutes to last 7 days), we see the instant discovery data of all applications, the number of users, their experience, and application health. The dashboard is also interactive, and allows users to perform deeper analysis tasks leveraging filtering and drill-downs. Many of our customers often use the Enterprise Applications dashboard to understand which applications are used heavily and by whom. In one example, this dashboard helped the IT team of a large corporation identify a set of applications that are in extensive use, and those that were not. Identifying the popular applications allowed the team to proceed to creating custom Aternity monitors for these applications and measure their SLA and individual activities. For other Aternity customers, understanding the actual applications being used by real users helped eliminate or endorse non-authorized applications and combat Shadow IT, while also helping to engage in license optimization strategies in order to eliminate paying for software that wasn’t needed. 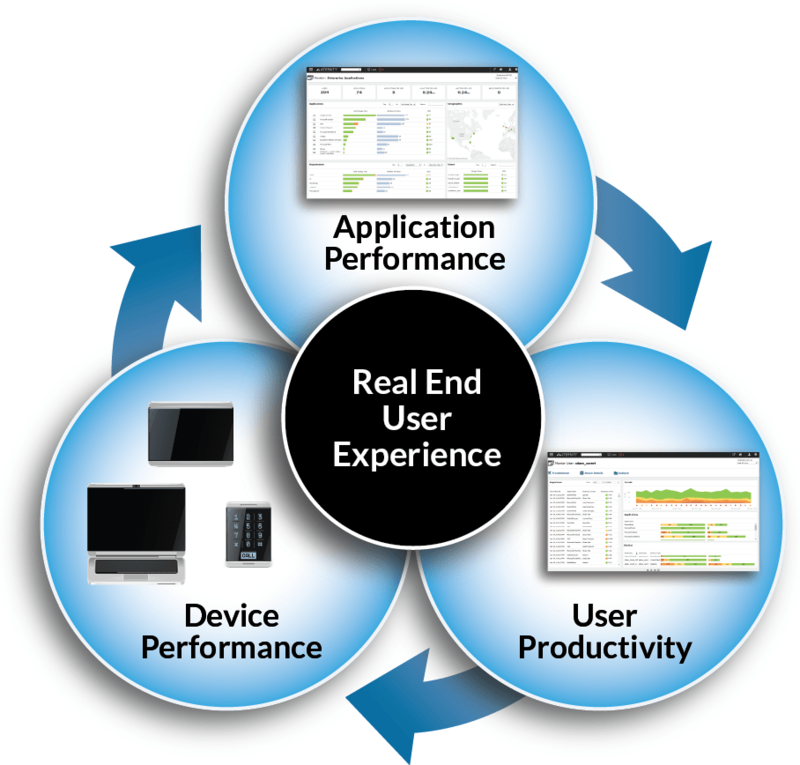 The Enterprise Applications dashboard features a User Experience Index (UXI) metric. This key metric is a value between 0 and 5 which measures overall performance and health of an application, based on the number of crashes per hour, the percentage of hang time, and the percentage wait time out of the total usage time. For web applications, it also uses the percentage of web page errors out of all page loads, and the average page load time. Aternity automatically calculates UXI for every application in the enterprise with no configuration required. 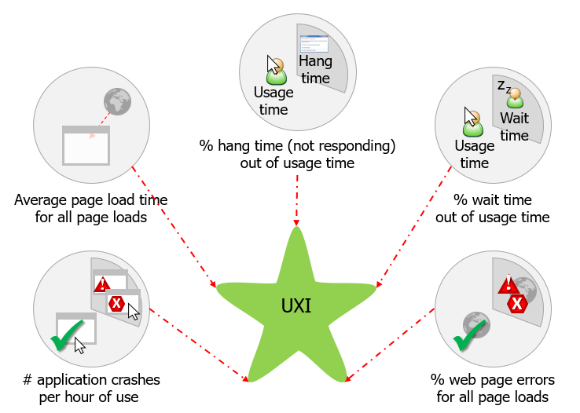 Per the example below, you can see that it shows the overall UXI and activity score, the number of unique users, devices and applications actively monitored, and the usage time per user: The overall User Experience Index (UXI) is 3.6 out of 5. You will also see that the above displays an Activity Score metric (the box immediately to the right of the User Experience Index). In the example above, we can see that this activity score is 87. The activity score is a color-coded value between zero and 100 calculated with a formula based on Apdex. The Activity score aggregates the performance of business activity response time relative to performance targets. Since Aternity provides business activities out-of-the-box for the most important Microsoft Productivity Suite applications, you get the Activity Score for these apps with absolutely no additional configuration required. Both of these metrics come together on the Enterprise Applications dashboard to represent the overall experience of a user. Note that unlike activity scores, which represent relative performance and may vary between different times, locations or applications, UXI is an absolute measurement that does not vary. I hope that I’ve been able to tell and show you how the Enterprise Application dashboard helps our customers see the immediately-discovered UXI performance data, and the activity scores, for the entire enterprise and for specific applications. Our customers can quickly view usage time and wait time, and number of unique users, across multiple dimensions such as geography, department, and operating system. The dashboard also shows usage trends and application health event volumes over time. If you would like to learn more please visit Aternity’s full documentation, or, if you are currently an Aternity customer, please enroll in our interactive class. If you’re experiencing IT challenges similar to the ones above, register for a free evaluation.